The foundations of Katsam Enterprises were built with family ties, family sweat, and family values. Jim Larko, owner of Katsam Enterprises and president of NAPSA, named his business for his children, Katie and Sam. “After all, we don’t work for ourselves, we work for our kids,” says Larko. 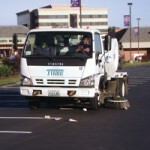 Within another few years, two property managers approached Larko and told him that he should consider parking lot sweeping. By the end of 1996, he bought his first sweeper. Larko soon had eight properties to sweep seven nights a week. He hired personnel to do the sweeping. The other driver’s insurance company bought them another sweeper to replace the damaged one and they quickly had two sweepers. Katsam now has 10 sweepers, six pressure washers, and one full-time and one part-time day porter, with a total of 26 employees. At one of the trade shows, Larko found a guy from Texas that developed a company handbook. Larko changed the book to meet his company’s needs and has since shared it with others. For pressure washing, Larko came up with a pressure washer that reclaims the water. “We revamped this thing and it’s a pretty neat system. I’m thinking about going to market with it, but right now I’m not seeing a lot of people who want to pay extra for green. Right now, we have this big brown river that people don’t seem to care about. Motivating employees is always a management dilemma too. Larko has tried bonus incentives from other companies and has found that cash usually works up to a point. Family isn’t always defined by blood. Sometimes, it’s what you make it and Larko has created an extended family at Katsam.